Yesterday, we looked at some gorgeous underwater photography taken with the Canon 5D Mark II. Today, we have an article explaining a bit of the logistics behind such shooting, from the waterproof gear to the reasons you'll curse into bubbles. 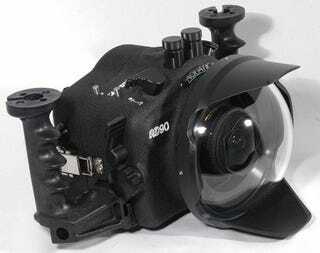 Drew Wong, for the site WetPixel, tested a pair of waterproof camera housings for the Canon 5D Mark II. While never explicitly stated, his favorite seemed to be the Aquatica for its ruggedness and utilitarian access to so many camera controls—though I'm guessing price came into consideration as well. The Aquatica costs a hefty $3000, but keep in mind, the lightweight, ergonomic Sea & Sea MDX Pro he tested alongside it costs $1000 more.